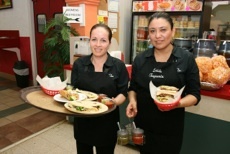 Luis’s Taqueria was founded by Luis and Luisa Quintero. The couple moved to California from Michoacan, Mexico, in pursuit of a better life. Luis worked in various jobs from the california fields to construction to a Dairy just to name a few. Luisa always helped by working seasonal field work and then as the children came along she became a stay home mom. But it wasn’t until September of 1989 that the couple decided to move to Oregon. Desperate to have something of their own they decide to open a Mexican Bakery in Newberg, Oregon. It was a small grocery store but also sold food to-go. Their menu wasn’t as extensive as it is now, but it was a start they always said. After 24 years of hard work and dedication to their business, Luis and Luisa, have passed down the restaurant to their nephew Jesus Gonzalez and his lovely wife Monserrat. Luis and Luisa are beyond happy that the restaurant will continue to stay in the family, and more importantly, they know that they have left their legacy in great hands. “Our goal is to continue serving the same great recipes that my Tio and Tia started in 1993. We are proud to follow their footsteps and aspire to continue to be known for our delicious, authentic Mexican food”, says Jesus Gonzalez. Luis’s Taqueria has come a long way, yet the goal remains the same. They strive to support local farms and the community, and always remember their humble beginnings.